I like simple. I like natural. I like real. I think that sums up my approach to styling rooms. Yes I could have spent a lot more money and a lot more time styling the fireplace for Fall, but why? Here is what this area looked like before. The first thing I did was to add a pitcher full of fresh mums. 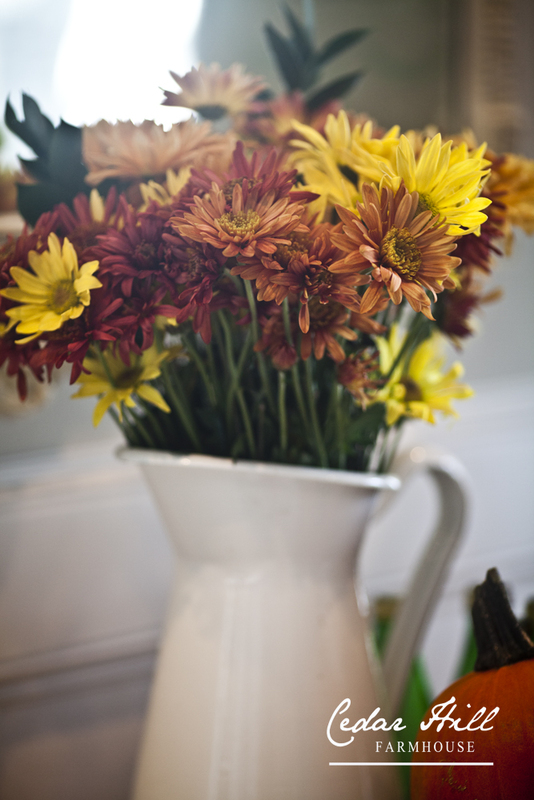 Fresh flowers are ALWAYS in fashion, and these mums add the fall colors I was looking for. I also added three small pumpkins to the mantle. Simple, natural, and real. For the three pumpkins and the flowers I spent less than $15. 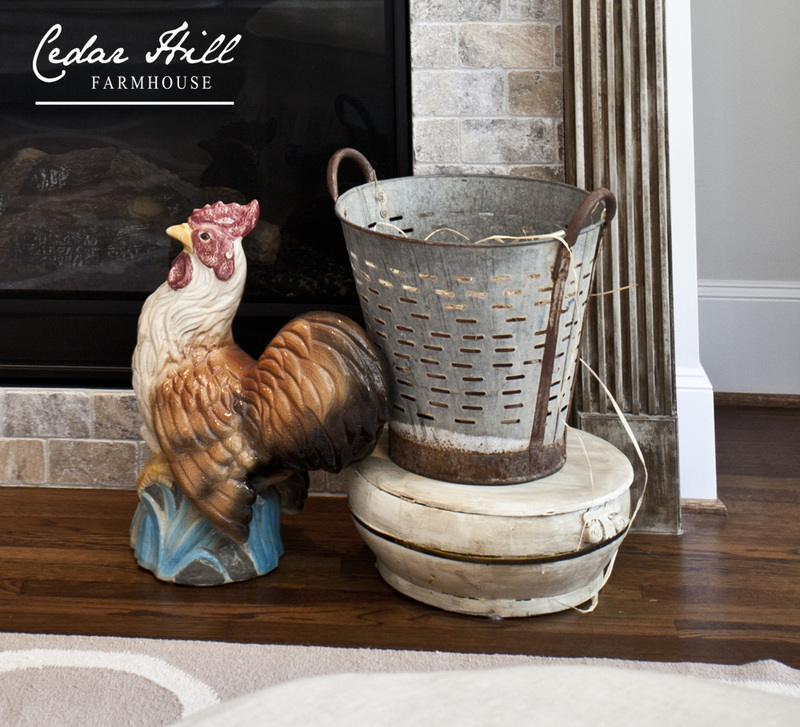 To repeat the fall colors I moved a rooster next to the fireplace, and added the vintage olive bucket. I added a wooden box under the vintage bucket to give it some height and so the bucket wouldn’t be the same height as the rooster. Also notice I used big accessories on the floor. Small things would have gotten lost. After looking at the bucket from a distance, I decided it would look better and more cozy with a neutral throw added. I also added some color with the quilt, a pillow, and a gorgeous coffee table book about Provence that I love to peruse. So that’s my approach to fall vignettes, simple, natural, and real. Throw in $15 for supplies, and about 15 minutes and boom. you’re done. Be sure to check out the other homes on our home tour. Each one will provide some tips or how to information. A beautiful simplistic Fall vignette! I adore the subtle addition of color with the pillow and throw!!! I like the simplicity of it too. You definitely gave your room a Fall feel with just a few pieces. Simply beautiful, Anita! Wonderful ideas. I love the unexpected throw draped in the olive bucket. very pretty, Anita! 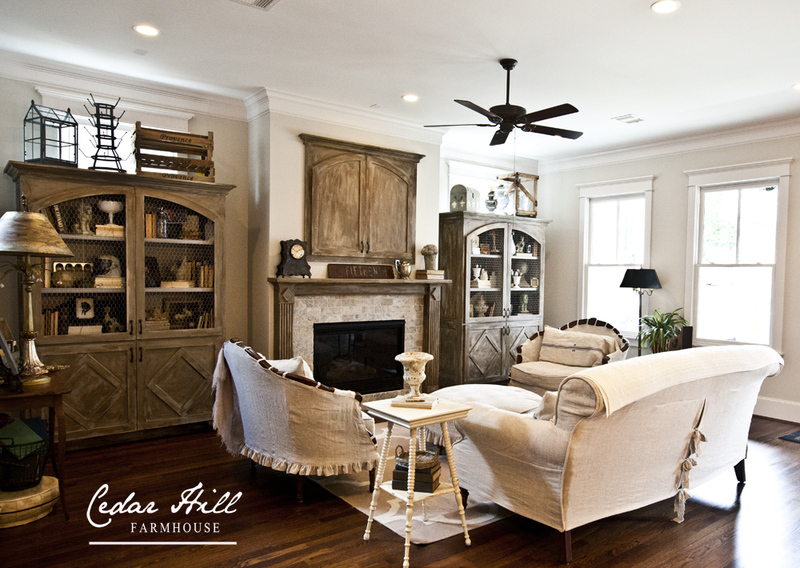 The natural elements blend so well with your new home. anita- you do simple, natural and real so beautifully. I can just see myself sitting in that chair with my feet propped up with a good read. Have a great fall day! So beautiful, Anita…as always! I’m so happy to be on this wonderful tour with you! 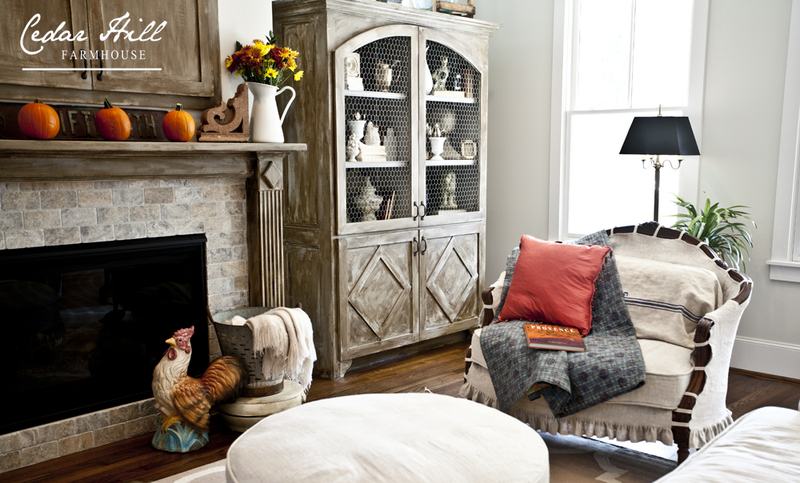 You may call it simple, but the items you use around your fireplace make a big impact! You use just the right amount of bright fall color to make the room look cozy and inviting!! Beautiful, Anita. Thanks for all you’ve done to make this tour a success! I’ve always been a big fan of simple when it comes to decorating. Your room is beautiful! Anita, I love your tasteful and neutral approach to decorating. Also love the use of “old” or repurposed items. I make slipcovers and love the chairs with the wood showing through. Very creative. What is the style of this chair? I would love to find one to slipcover for my guest room that I call “The French Room”. The chair is a French one. Your home is absolutely gorgeous Anita! Love your beautiful vignettes.They are simple and so elegant! Anita your space is so cozy! Love fresh flowers in a space and your layers of cozy cuddle-up throws. Your French Farmhouse is very beautiful ! This room just makes my heart beat faster! 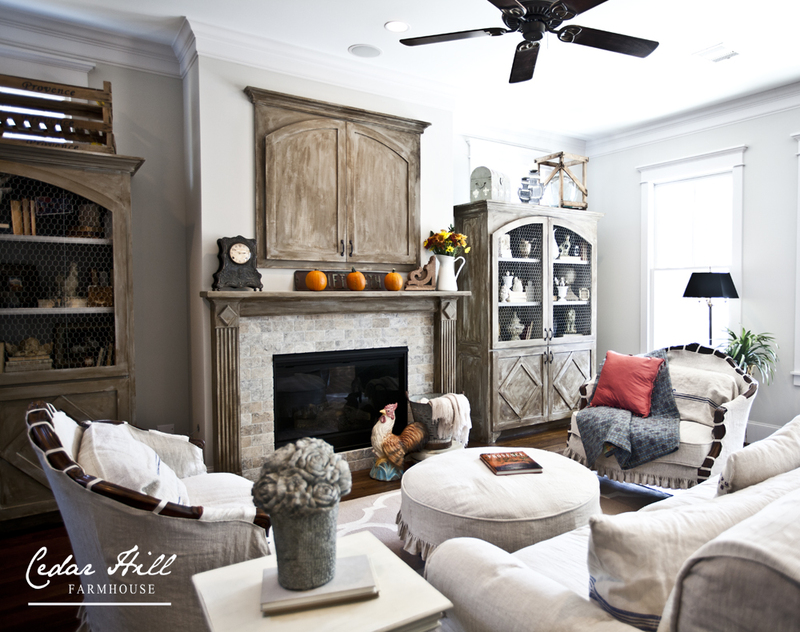 Now that you have added your beautiful Fall touches it just says come on in and get comfy! Beautiful, Anita. It’s been a long time just getting back with my Tablescapes. This room is so beautiful simplistic Fall vignette love this! I love the way you put this all together with the addition of color with the pillow and throw!!! I hope you have a wonderful weekend with your family. Anita, I remember when you upholstered your gorgeous furniture, and the small touches of fall allow it to be the star of your room. I also love the small detail of the throw in the olive bucket. Pinning! Just lovely, Anita! This tour has been the best – so glad to be a part of it! Simple is best Anita…truly lovely! My kind of decorating! I love simple, natural and real, too. The throw and pillow and just the perfect splash of color. them on an a shelf unit during the summer to enjoy them outside. Your approach to the room’s fall decor looks great. 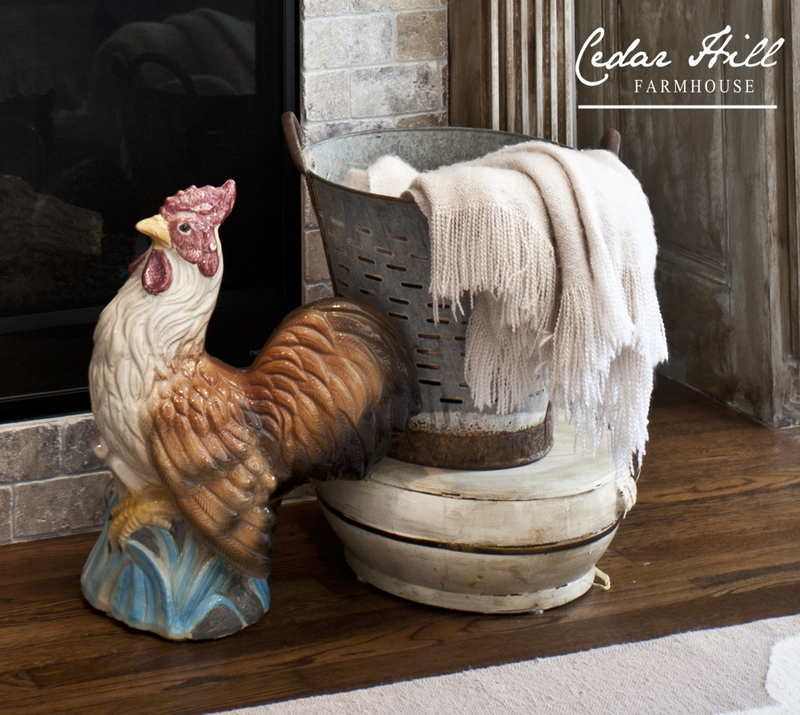 I love roosters and chickens, and I think yours is looks great at the fireplace! I love the simple way to decor the best. The three pumpkins do more by themselves than a whole bunch of fall items crowding the mantel. I love simple but to me it also has a touch of elegance because of that. You don’t need a lot of money or time and you’ve proved that! Great job! Thanks for joining us on the ATH tour! Truly a French-inspired vignette…elegant, subtle, and warm. The white stoneware pitcher, olive bucket, rooster, mantle clock, and the worn sign in the background…all French elements that reflect a natural, easy style of living. Perfect example of How To Create a French look…my favorite look. I have several posts on the technique I used. But that is just an undercoat of homemade Calcium Carbonate paint, then I added a coat of dark Annie Sloan wax. The paint is one cup latex paint with 2 tablespoons of calcium carbonate. You might add a little bit of water to the calcium carbonate first before adding it to the paint.